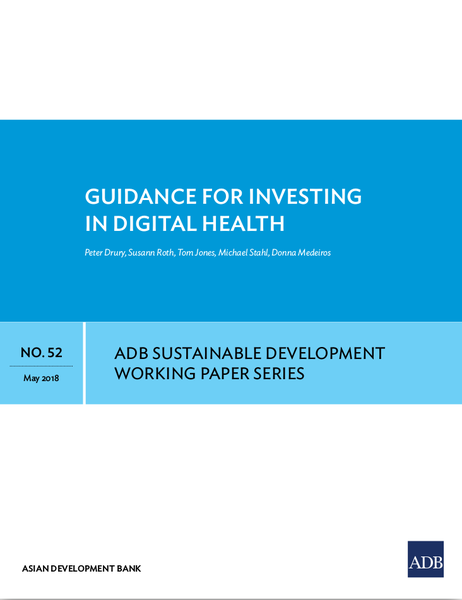 The ADB’s Guidance for Investing in Digital Health was published in May 2018. It was developed by Peter Drury, Susann Roth, Tom Jones, Michael Stahl and Donna Medeiros. It helps Ministries of Health and health systems decision makers understand the issues to be considered in framing strategic investment decisions in digital health in support of health policies, e.g. Universal Health Covearge and the Sustainable Development Goals. Issues include: supporting stakeholders with strategy and architecture; understanding the cycle of change for making digital health investments and keeping an eye on future trends. Issues around supporting the digital health investment processes are covered in more detail in the accompanying Digital Health Impact Framework User Manual. The Guidance is intended to be a dynamic document. A short version of key points is available at https://sites.google.com/view/digitalhealthasia/home and this also contains a link to an online version which includes online links to additional material.